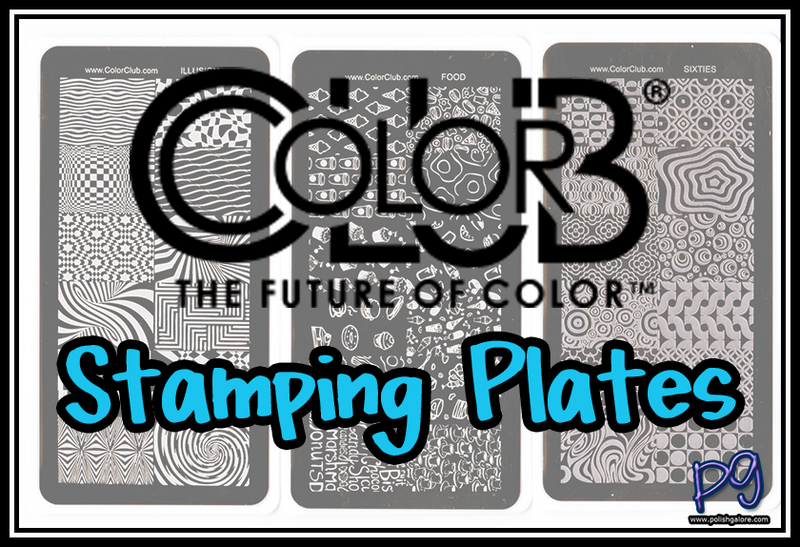 At Cosmoprof North America, I found out that Color Club was going into the stamping business - and boy were they ever! Launching over 40 plates out of the gate, they mean business. Also while at Cosmoprof, I was blessed to meet the husband and wife duo behind the stockist site Color4Nails. 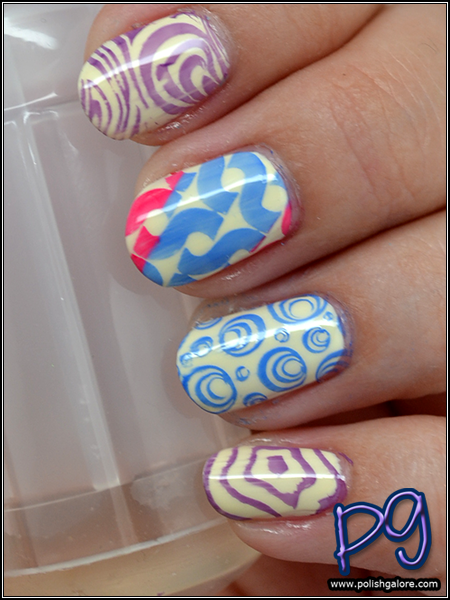 This posting will be about the Color Club Stamping Plates but they were provided to me via Color4Nails. Side note, Color4Nails is a small home business that was founded in 2011. 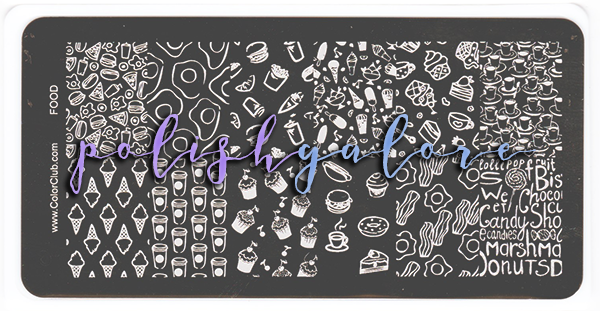 Their goal is to offer unique polish from different counties as well as from independent polish makers. 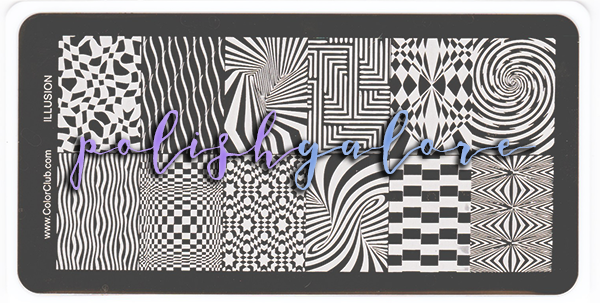 What I really love is that they have some amazing collaboration polishes only available on their website but we will talk more about that later. The above 3 plates are the ones I received from Color4Nails. Since they were a press sample, I cannot speak to the ease of purchasing through the website, but I was happy that they were well packaged. I had received 2 bottles of nail polish as well and they were also well packaged. 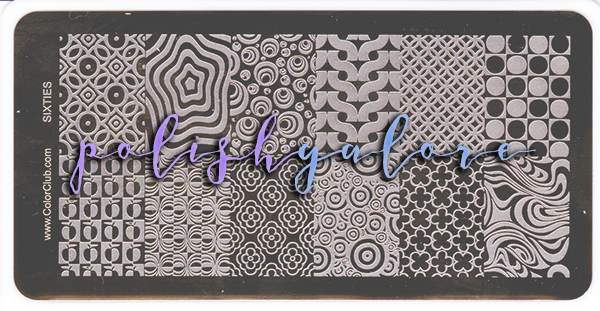 If you've been reading PolishGalore for some time, you may recall another stockist/beauty website that sent me a horribly "wrapped" package, so it's important to me that things are properly packaged. The first plate I used was the Color Club Sixties plate. First, take off the protective plastic from the plate. Apply your desired polish to the plate, remove excess with a scraper, use your stamper, and apply it to your nail. Since this was my first try, I decided to use 4 different designs. The plates are gold in color and the outer white area is a plastic attachment that keeps you from banging the plate's edge. To keep it clean, I scraped towards the plate instead of off the edge. For reference, I used a base manicure of LVX "Vanilla". I used Digital Nails "Questionable Browser History" which is a liquid latex masking fluid to cover around my cuticles so I didn't have to clean up as much. For stamping, I used CND Creative Play in "Red-Y To Roll", "Royalista" and "Isn't She Grape". For top coat, I used CND Creative Play top coat. My scraper and clear stamper were from UberChic. So I'm pretty impressed with the pick up of each stamp. The designs are all well etched inside. The smearing you see is from my top coat. I have to now rummage through my box to find one that doesn't smear. I had also attempted Digital Nails "Ain't Nobody Got Time For That" top coat (smeared) and Anonymous Lacquer "With A Quickness" top coat (smeared) and this was a good 5 minutes after stamping. 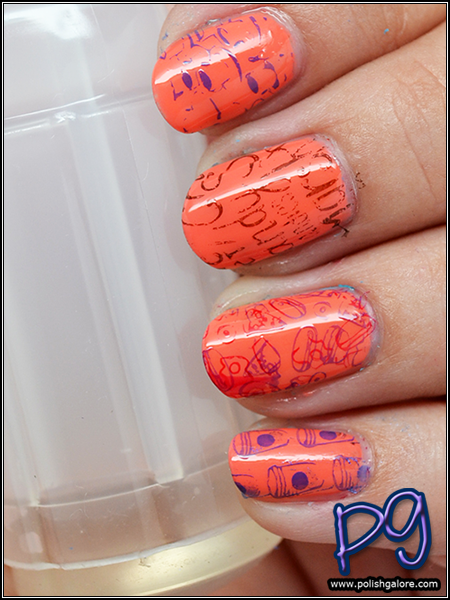 There's also the possibility that CND Creative Play isn't a great stamping polish. It's made to be a lacquer, and is not branded as a stamping polish. The second plate I used was called Illusion. I used a base manicure of Glisten & Glow "Snorkel in St. Thomas". I used Digital Nails "Questionable Browser History" for my cuticles. For stamping, I used M Polish "I Need A Vacation" and LVX "Crimson". For top coat, I used Love Angeline "Topped With Love". My scraper and clear stamper were from UberChic. LVX is used on my index and pinkie, M Polish is on my ring and middle fingers. 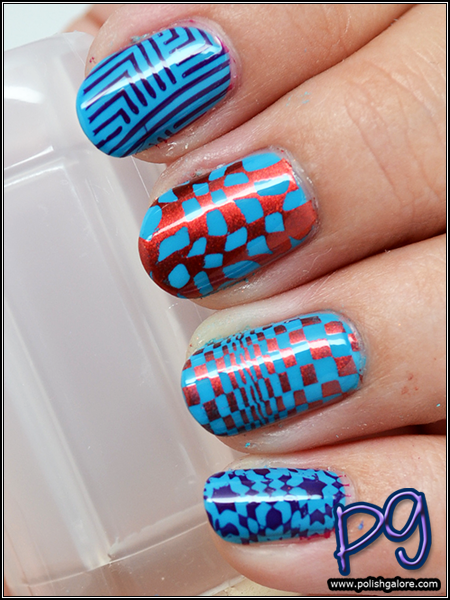 M Polish is an actual stamping polish and you can see how it works beautifully. LVX also works but it's not as crisp. I actually had a really hard time with this plate picking up images the first time. I don't know if it's a combination of my stamper and polish or what. It looks etched just as well as the Sixties plate, so I'm not sure what's going on but I really love the different designs available. The final plate I received was Food and this was the one that I felt was the most detailed by far. Sadly, it's also the one I had the absolute hardest with. Granted, I'm still very novice when it comes to stamping, so it may just be all that. I also want to try another stamper in the future. I used a base manicure of Dermelect Explosive. I used Digital Nails Questionable Browser History for my cuticles. For stamping, I used M Polish "Pish Plashin' Around", CND Creative Play "Red-Y To Roll" and "Isn't She Grape?" and LVX "Mink". For top coat, I used Love Angeline "Topped With Love". My scraper and clear stamper were from UberChic. Not going to lie, I feel like a major failure right now with this last plate. I tried a double stamp on my ring finger and that just looks like mud. My index refused to take up the image. The words are a mess on my middle finger. The only one that came out half decent is my pinkie. I think my base manicure probably wasn't the best idea either. I should have gone with something more neutral. Overall I think these plates are really nice - well etched, durable and lots to choose from. I don't feel totally defeated and want to look at picking up some more stamping polishes. M Polish is currently closed so I can't grab any more of hers but there are a couple more indie companies popping up and there's always Konad as well. I'm hoping Color Club comes out with a line as well. You can purchase the Color Club Stamping Plates directly from Color4Nails here. Be sure to check out Color4Nails's social media on Facebook, Twitter and Instagram.